Sometimes you want dinner to be easy. Perhaps you’ve had a long day at work, or maybe you’re just feeling a bit lazy. Chances are you’ve had one of those evenings where cooking an extravagant meal for you and your family just seems like too much work. No judgment. Everyone has those nights. The good news is that you don’t have to sacrifice extravagance for deliciousness. These three-ingredient recipes can help you plan a quick, simple dinner that will keep everyone at your table happy and full. To keep the meal well-rounded, here are recipes for a main course, a side, and a dessert. Chicken. It’s a delicious source of protein that can be cooked a wide variety of ways. 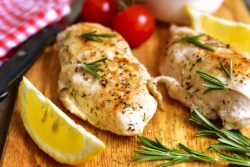 This baked chicken recipe, aside from tasting great, may be the simplest offering today as you probably have most of the ingredients in your kitchen already: boneless, skinless chicken breasts, butter, and salt – that’s it! 2. Stir ¼ cup melted butter and salt together in bowl. 3. Arrange chicken in baking dish. Brush butter mixture onto the chicken until coated, pour extra over chicken. 4. Bake about 30-45 minutes or until no longer pink and juices run clear. The only meat that may be more popular than chicken is bacon. And as sides go, you can’t really go wrong with a bacon green bean casserole. If you’ve got some green beans, bacon, and a bit of French salad dressing, you’ve got yourself a delicious side dish. 1. Preheat the oven to 350 degrees F. Grease baking dish. 2. Fry bacon in a large skillet over medium heat until crisp. Drain on paper towels. In a large bowl, stir green beans and salad dressing; pour into dish. Crumble bacon over top. 3. Bake uncovered for 30 minutes. Last, but very far from least, is the dessert portion of this simple meal experience: peanut butter cookies. This offering is particularly great to make with children if you have some in your household, as it is easy to do. And, like the chicken recipe above, it is pretty likely that you already have these ingredients in your house: peanut butter, eggs, and white sugar. 1. Preheat oven to 350 degrees F. Line baking sheets with parchment paper. 2. Combine the peanut butter, white sugar, and egg. Mix until smooth. 3. Drop spoonfuls of dough onto the prepared baking sheet. Bake at 350 degrees F for 6-8 minutes. Do not overbake! Cookies are best when soft and slightly brown on the bottom. Whether you’re a wizard in the kitchen or a novice learning to cook, these three recipes can help you prepare a meal for yourself, your friends, and your family without the stress of larger, more work-intensive dishes. Save yourself a bit of money on ingredients and savor the delicious dinner and your time with loved ones. Of course, as with all new foods, be sure to check the lists of ingredients (which shouldn’t take too long) to ensure it doesn’t contain anything you shouldn’t eat. Bon Appétit!